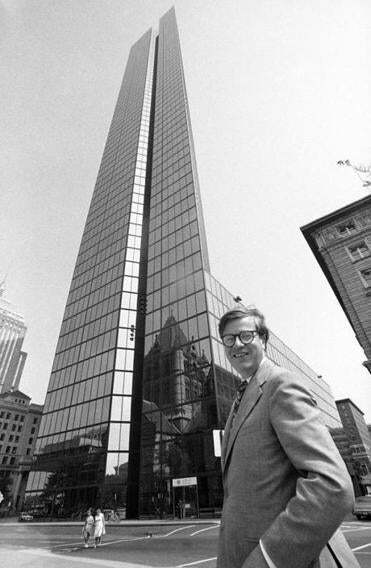 Architect Henry Cobb, in front of what was then known as the John Hancock tower in 1977. Henry Cobb may be the most accomplished Boston-born modern architect. Yet the 92-year-old, known as “Harry,” has always had an uneasy relationship with his native city. A true Brahmin, he fled as soon as he graduated from Harvard in 1949 and eventually partnered with I.M. Pei in New York. “I paid for my infidelity by thinking about Boston every day of my life,” he says. Approach the city from the north, south, west, or the harbor, and you can’t miss Cobb’s vision — from his 1963 master plan for Government Center; the Harbor Towers; the John Hancock tower; the Moakley Courthouse; and One Dalton, now under construction in the Back Bay. He’s the rare figure who knew what it was like to build a skyscraper in Boston half a century ago, during the city’s first skyward reach — and what it’s like today. Over the course of two days in early September, Cobb spoke with Ideas by phone from his Park Avenue apartment. What are some of the lessons learned over your career that are manifest in the design of One Dalton? So much goes into making a building into a good citizen: You need to give it a personality, one that embodies the variety of uses that will take place and the variety of expression that that engenders. Having lived in the city all my life, I like rooms that offer you views in more than one direction. That’s the origin of the defining notches in the façade of One Dalton. An architect makes a city of towers more interesting by designing them so that they can participate in the very lively urban conversation. The most important consideration today is recognizing that a building has a responsibility to become a combined work with what’s around it, with the historic city, or with a planned future. In Boston, you shouldn’t obliterate all traces of the past. The John Hancock tower was finished in 1976. You faced the ire of Bostonians and architects when it was first approved. Would it be easier to build this tower now? No, but for different reasons than we faced. It was opposed in 1968 because it was considered to be virtually a crime against humanity to put a skyscraper next to Trinity Church. Today, the problem would be shadows — the shadow that it casts on Copley Square and on the church. The disjunction of scale is no longer the main concern. There’s a change in the value system. As Boston grows upward, should we worry about height and shadows? It’s not that tall buildings are good or bad. What’s important is the relationship of tall buildings with what’s around them. So no, we don’t need to fight over height. What we need to fight over is the coherence, the drama, the excitement, the juxtaposition of things in the city. You write about a component of the Hancock tower project that was never realized, which still bothers you decades later. I still feel enormous sadness, regret, and anger about the fact that the planned conversion of the Clarendon Building across the street never happened. You must understand that a tall building in a city is in intense conversation with the things around it; it’s a combined work. That’s the key. The buildings and landscape are put together in a way that each component seems to become more interesting because of the presence of the other, rather than one wiping out the other. The Hancock was not just a combined work with Trinity Church. It was also to have been a combined work with the Clarendon Building across the street, now a 12-story office building. Our plan was to bring it back to its original three-story height, where it was most successful as a work of architecture. We planned to take the core out, make it into a courtyard, and convert it into a cultural building with three very important institutions: The Horticultural Society, The Center for Adult Education, and the Children’s Museum. Everyone was all signed up. And then, when the tower’s [falling windows] problem came up, the Hancock company dropped [the second phase]. All the emphasis was on the Plywood Palace, as they called it, and no one noticed that Hancock just canceled the whole Clarendon Building phase. And today, nobody knows about it. That conversion was to have brought cultural activity back into Copley Square — allow Copley Square not just to become relevant by the relationship between the tower and the church, but also to become relevant by strengthening its intended role as a cultural center. It’s a great, great tragedy for the city that this didn’t happen. The Hancock stands alone on the skyline. If an adjacent tower project came along, what would you tell the architects to think about to protect your legacy? I don’t think the Hancock is threatened. In a curious way it will never be threatened because it’s protected by the Back Bay. The view that everyone loves — from MIT and across the river with the sunlight in the notch — that view is protected forever because of the Back Bay. Ironically, the system that you disrupted — the homogeneity of the Back Bay — is the same system that will preserve your work in the future. True. But [the Hancock tower] was a product of a power play on the part of the Hancock Company. These things happen in cities. And this was, of course, the source of my problem with my colleagues — that they saw the illegitimacy of the power play, or the immorality of the power play, as a problem. You describe the Hancock Building as, “Silence, muteness.” Would you say that, in that way, the Hancock is a self-portrait? By nature, I am understated. Clearly designing the Hancock did play to something in me, which is understatement. Yet the Hancock project was also so egregious and so extreme in its flouting of the rules: Buildings should not be mute; they should not be made of mirror glass; they should not be so big in an area populated by small buildings; they should not be so intrusive. We broke the rules because we had to rescue Copley Square. We had to bring it back into the game. That’s what the Hancock did. It brought Copley Square back into the game. The confidence I had in designing this tower was a direct result of my very real feeling that I understood the problem better than my colleagues in Boston because I grew up there. I knew Boston and I loved Boston, despite the fact that I left it, and I just thought that I understood it. I’ve built tall buildings in cities around the world. In those cities I’m always a guest, and a guest does not do that sort of thing. So yes, you could say that the Hancock was a reflection of myself, at that moment, when I was barely 40 years old. How has Boston changed since you were a boy? Boston had an extraordinary period of expansion in the late 19th century, and the two most vivid and memorable and still extraordinarily valuable products of that expansion were the Back Bay and the Emerald Necklace. The Back Bay has a coherence and character that has only become more memorable over time, as the city has surrounded it with buildings and developments of much larger scale. All that makes Boston sound like a very dynamic city. But what you have to understand is that in the time period of my childhood and youth, Boston was not a dynamic city. I saw it in my youth as a moribund city, economically, socially, politically, culturally. Books have been written about the reasons for that decline, but in the early part of the 20th century, Boston stalled developmentally. Boston suffered the fate of many American cities, decaying at the center and expanding at the periphery. But in Boston that was particularly severe because a lot of wealth was concentrated in Boston, or managed from Boston, or held by Bostonians, and in the latter part of the 19th century that wealth, instead of being invested in Boston, began to go west. Bostonians stopped investing in Boston. In spite of that stalling, things like the Central Artery happened. But that actually didn’t help much, because it erased part of the downtown and just went over it. You write that Bostonians are full of guilt. What did you mean by that? I was talking about the Puritan legacy that says that we are all sinners, which was still quite strong in Boston society when I was young, but today no longer is, and shouldn’t be. The old Boston is still there, but it’s nothing like what it was. In my childhood, when you were part of the old Boston, that’s all you were part of. Now, nobody would ever think of saying that. Boston really does embrace a number of cultures, and it’s one of the reasons that it’s now such a vibrant and amazingly diverse city. Your father blamed you in part for the destruction of the Boston that he knew. Did this Puritan guilt extend to the demolition of the West End in the 1950s? The West End was a tragedy because it wiped out one of the really most wonderful small-scale neighborhoods and replaced it with very mediocre high-rise buildings. It was a real tragedy. It was touted as a great achievement. But all of us architects, or at least all of us who were really engaged, regarded it with disdain. From your book, it’s clear that the 1971 Harbor Towers is not your favorite project. Harbor Towers is a flawed urban renewal project. The main reason that it’s fundamentally unsatisfactory is that the third tower didn’t get built. Those three towers were in a conversation with the space between them, and the space beyond them to the water. And none of that comes out now. It’s just two towers sitting there. Even if it had been fully built, it was arguably the wrong approach. If we were doing those towers today, we would move heaven and earth to save the Bulfinch building [that once occupied the site]. Whereas, in those days, the developer just said, “Yes, tear it down.” We didn’t even know that it was demolished until the developer came to us to design the project. It was already gone. I designed the Harbor Towers garage, too. I’ve always believed in mixed use and the importance of the ground floor being brought to life. I designed it to be a garage above, but the ground floor was all supposed to be retail. I don’t think it is anymore. What do you think of the development of the Seaport in the 20 years since you built the Moakley Courthouse? When we designed the courthouse, there was nothing around it. None of it. It was a blank empty space. And we imagined that we were setting the stage for what, at that time, we thought would be a development in the same scale as the warehouses. The new buildings are all very glassy, maybe too glassy. If you were to do one more Boston tower where would it go? Because I’m an architect. You’re asking me to be specific about something which I cannot be specific about. Everything has to be judged on its own merit.